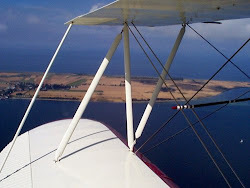 Flying Europe in an open-cockpit biplane in the summer of '97. Three months, 11 countries. Low and Slow. Listed below are links to background material that has been published by various aviation and Ferrari magazines. They add color and cover a broad scope of my flying, business and lifestyle during those years. 1. “What You Say Is What You Get: How to Master Power Talking, the Language of Success” - a book by George Walther (1991) contains a chapter about the several ups and downs and the final up-and-out success in business. 6. “Borrego Springs” - a story written by French aviation journalist, author, and aviation personality Bernard Chabbert (1999). He came over from France to attend the big party just before I left for the European tour. His writing is a lot different from the others, and his perspective is quite different in some respects. He has some facts and the sequence of some events wrong, but he's got the general idea right. This story was published two years after the party, and the Euro tour. It appeared in the British Pilot magazine. Video: There Goes My Biplane! Birthday photo, day 1 in the sun. This was the 50th Waco YMF-5 built by the factory, in 1993, in Lansing, Michigan. Built in 1994 to replace #1 which was destroyed in a freak landing accident. My instructor was the pilot. I was not in the biplane. No one was hurt. This #2 biplane was used for the European tour in the book. In Borrego Springs, CA. This amazing home was the product of a fantasy I had: To have my biplane in my bedroom! Somewhere near Denmark. It's easy to get caught up in the beauty, and get lost! 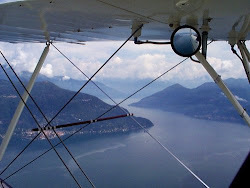 At the foothills to the Alps, some of the most spectacularly beautiful flying on earth! 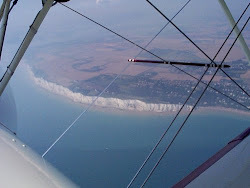 Crossing the English Channel. Immediately after taking off from France, the biplane was engulfed in a thick fog. I climbed for what seemed forever to escape it. Next Flying Story to Be Written?